Relax with the knowledge your landscape is being watered by reliable 5000 Series Rotors and industry-leading Rain Curtain Nozzle Technology. Rain Bird® 5000 Series Rotors are ideal for medium to large-size lawns and evenly distribute water from 25 to 50 feet. Superior Distribution Uniformity. 5000 Series Rotors with Rain Curtain Technology are engineered to deliver a uniform spray pattern, giving you a consistently green lawn throughout. The larger water droplets produced by Rain Curtain technology prevent misting and airborne evaporation so the right amount of water is delivered to the right place, saving you water and money. Gentle close-in watering eliminates dry spots around the rotor, prevents seed washout and allows the turf to grow healthy with no matting or bending. Multiple Rotating Streams Use Less Water and Provide Healthier Growth The revolutionary MP Rotator features a unique, multi-trajectory rotating stream delivery system that achieves water-conserving results. Rather than simply “spray” water onto landscapes, MP Rotators deliver multiple streams of water at a steady rate. This slower application rate allows water to gently soak into the soil and achieves an even distribution throughout the area being irrigated. This increased efficiency results in 30% less water use when compared to traditional sprays and significantly reduces wasteful runoff. 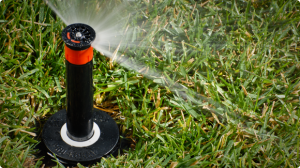 The MP Rotator can be installed onto any conventional spray head body or shrub adapter, transforming them into high uniformity, low precipitation rate sprinklers with matched precipitation at any arc and any radius. The MP Rotators are a great choice for new systems, as they provide immense range flexibility (from 5’ strip to 35’ radius), decrease material costs, and provide better system efficiency. MPs are also perfect for revitalizing older systems—a retrofit can solve both low pressure and poor coverage problems. The MP Rotators are a great choice for new systems, as they provide immense range flexibility (from 5’ strip to 35’ radius), decrease material costs, and provide better system efficiency. MPs are also perfect for revitalizing older systems—a retrofit can solve both low pressure and poor coverage problems. Hunter Pro-Spray sprinkler heads are precision engineered to ensure long-lasting, reliable performance in residential applications. Available in heights from shrub to 12”, Pro-Spray heads feature durable construction that is second to none, exclusive body cap design which does not leak even when loosened, and a reliable, easy to adjust two-piece ratchet. Pro-Sprays are compatible with Pro Adjustable Nozzles, Pro Fixed Nozzles, and MP Rotators. All models also include a user-friendly pull-ring flush cap to keep debris and clogging to a minimum. The Hunter Pro-Spray sprinkler head is compatible with all industry standard female nozzles offering a high degree of flexibility.